We’re proposing to upgrade paths in Stoke Park, to make it easier for more people to make use of the park and to support new housing in the area. Our proposal is to upgrade an existing path connecting Lockleaze with Jellicoe Avenue at the eastern edge of the park, to create a new all-weather accessible path for both walkers (including families with push-chairs, older people, and those with mobility difficulties) and cyclists. At the moment, it’s difficult for people with mobility difficulties or pushchairs to enjoy the park because the paths get muddy and the surface can be uneven. We’ve undertaken a public consultation where a majority were in favour of the scheme. There will be a further public consultation as part of the planning application. You can find the plan of route options further down this page. The planning application for the path has been submitted. You can now view and comment on the planning applications. Separate planning applications have been submitted to Bristol City Council and to South Gloucestershire Council. The Bristol City Council application reference is 19/01213/FB. You can view the planning application by clicking this link. The Bristol City Council deadline for comments is the 17th of April 2019. The South Gloucestershire Council application reference is P19/3047/F. You can view the planning application by clicking this link. The South Gloucestershire deadline for comments is the 4th of May 2019. Why are we doing this work? 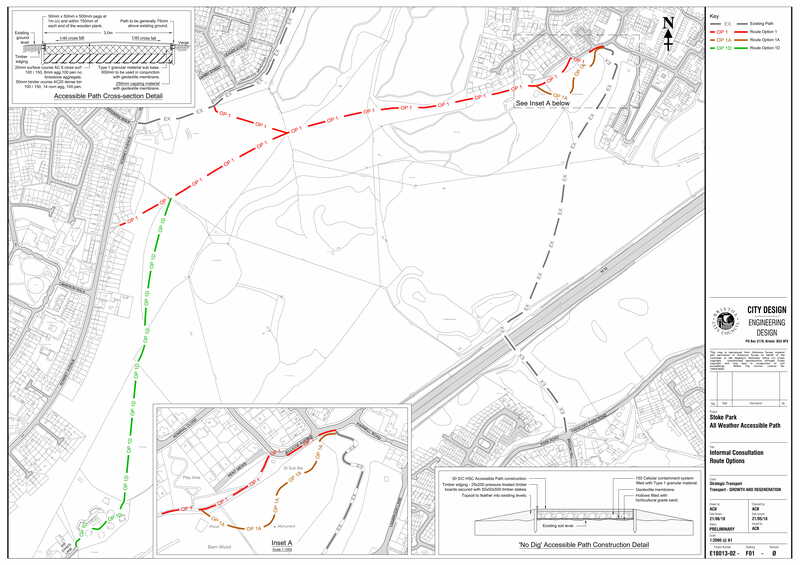 As well as enabling more people to enjoy the park, the upgraded path would also connect Lockleaze with the existing all-weather path in Stoke Park that runs from Cheswick Village to the M32 underpass, so it will be easier to travel from Lockleaze to Frenchay, Broomhill, and other destinations. We have also chosen this route because the Stoke Park Conservation Management Plan identifies upgrading the historic carriage drive as a priority. The work we’re doing tries to make the path as accessible as possible while also combining well with the Conservation Management Plan. As part of improving access for those with mobility difficulties and limiting illegal motorcycle entry to the park, we are also interested in your views on whether we should improve the access barriers around Stoke Park. We’d also like to hear your suggestions for other features, such as seating and information boards. We’re undertaking archaeological, bat, ecology and tree surveys in advance of any works commencing. We’re currently bidding to the West of England Combined Authority to fund this work. Separate to this project, we have additional funding from the Housing Infrastructure Fund that we can use to provide other transport improvements. If both applications are successful, we will have secured £10m of funding to be spent on delivering transport improvements in Lockleaze. No money for these projects will come from council funds, so it represents a major boost to regeneration efforts in the area. 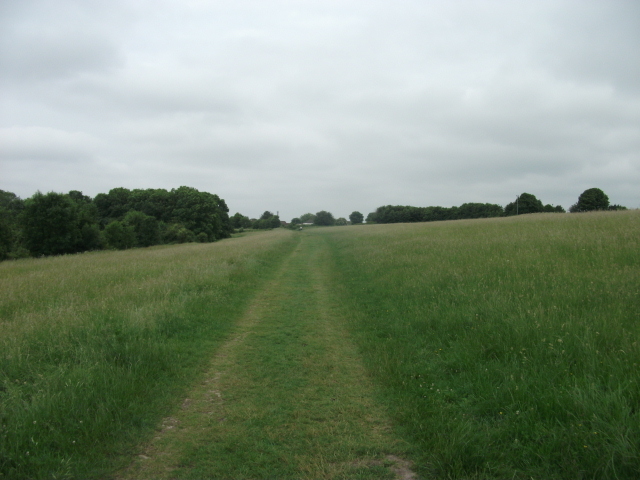 Through the Stoke Park Conservation Management Plan, the council already had plans to improve much of the path route we intend to upgrade. Because this project is not funded by Bristol City Council, it will allow us to spend council funds or other grants we get on more improvements to Stoke Park. What are the results of the public consultation? Overall, a majority were in favour of the scheme (of the people that expressed agreement or disagreement). We also asked questions about lighting, surfacing, the route of the path, and much more. You can download the summary results, full consultation report and design review in the Download section at the bottom of this page. The plan below details the potential route options. Click on the image to view it in a larger, more readable size. What does the current path in Stoke Park look like, and what are the different upgrade options? All-weather accessible path – similar to existing Stoke Park path between Jellicoe Avenue and the M32 underpass. This involves a bituminous construction with a buff-coloured screed surfacing. It's quite expensive to install but requires little regular maintenance and has a relatively long design life. The buff colour blends in with the park landscape. Good for all users, including people with mobility impairments. This is the current preference. Tarmac path. Moderate cost of construction and requires little regular maintenance and has a relatively long design life. It has a high visual impact on the landscape, as more suitable to an urban setting. It's accessible for all users, including people with mobility impairments. Bound gravel path. Moderate cost of construction but can require regular maintenance, depending on impact of wet and cold weather, which also affects design life. Buff coloured surface available, which is consistent with heritage locations, and has less visual impact on landscape than black tarmac. Not so good for some users with mobility impairments, especially if surface becomes uneven. Existing surfacing, being mainly mown grass. The option is to simply widen existing paths and use the same surfacing. Whilst cheap, it is low quality, doesn't improve accessibility for people with mobility difficulties and is less likely to attract new users of the park. As before, it'll become wet and muddy and need regular maintenance. It's not considered appropriate for external funding bid. Why are you building the path? The new path will both help people connect better between Lockleaze and other areas for employment, education or leisure purposes, and help improve access into Stoke Park for users, especially some people with mobility difficulties. Why has the path been identified as a priority mitigation measure above other work? To help meet Bristol’s housing shortage, we have plans to build approximately 1,000 new homes in the Lockleaze area. New residents will need to move about so we have to improve the local transport network to reduce levels of congestion. We are looking to encourage people to use sustainable modes of travel, such as walking, cycling and public transport. The new path is one measure that has been identified as being important to support the new housing and encourage people not to always use the car on busy local roads. Why does the path have to be built across Stoke Park? We want to try and maximise the benefits of the investment. One objective is to help people access employment, education and leisure destinations around the Stoke Park area more easily and quickly by walking or cycling. In addition, we would like to improve access into Stoke Park so that more people can enjoy the park and the new path helps achieve this objective too. We also have plans to surface the historic trackway running through Stoke Park and the works would provide this, without the Council having to pay for it. What effect is the path expected to have on reducing the impact of housing on the local road network? A network of good quality paths will allow pedestrians and cyclists to move about more easily and safely. This can help to encourage people not to use their cars for some trips, which will help to reduce the impact of housing, in terms of increased congestion and air pollution on the local road network. How wide will the path be? We propose the path be 3.0 metres wide. This is recommended minimum width for a shared use path, which is a path that pedestrians, wheelchair users and cyclists use together. We would normally recommend a wider path but recognise it would have a greater impact on the Park. What effect will construction have on trees in the park? This depends on the final route that is selected. The east end of Option 1A goes through the wooded area and this would mean a number of small trees would have to be removed. Option 1B uses an existing track and the only impact would be pruning any low hanging branches. What effect will the path have on the historic grassland? The path route options follow existing paths, which are mown grass. We will have to widen the path in some places, but this should only affect a very small amount of the grassland. A surfaced path will not become muddy during wet periods. How will you ensure workers treat the park with respect? The contractor will be required to submit a Construction Management Plan and this will need to show how any particular planning conditions relating to planting, wildlife and tree protection is taken into account. We will be supervising the contractor to ensure the works are carried out in the correct manner. What are the effects on protected species? We have a lot of ecological information about Stoke Park and are also getting more ecology survey work done, in relation to the proposed path. This survey will make recommendations, with regard to protecting species during the work and planning conditions will be set if required. However, as we are widening and surfacing existing paths, we think any impact will be minor. We will include protection works to help minimise the impact and sensitive locations of work will be supervised by an ecologist. Why are you recommending a tarmac path when the Conservation Management Plan recommends gravel? We think a tarmac path, with a buff coloured resin surface, similar to the existing east path, is better for use by all users, including people with mobility difficulties. This surface is in keeping with the existing path and a tarmac path requires less regular maintenance and should last a lot longer, which is an important financial consideration. Why are you building this at the same time as the Countryside Stewardship plans? We have received funding to develop the path proposals and obtain the necessary consents and this work has to be complete by May 2019. We then have the opportunity to bid for funds from WECA to build the path and, if successful, those funds need to be spent by March 2021, so the path needs to be complete by then. The path works should have limited impact on the Countryside Stewardship plans. WECA funding means the Council does not have to pay for the works. What are the effects on the important views identified in the Conservation Management Plan? The path works will widen and surface existing paths running along the north part of the Park. Whilst there will be some visual impact from having a new buff coloured path, the alignment follows natural contours so will have very little impact on the important views. Why is the path shared-use? We think cyclists should also be allowed to use the path (some cyclists already use the grass path), along with other user groups. We could have designed a path that segregated cyclists from walkers but this would have required a wider path that would cost more and have a greater impact on the park. Will horses be able to use the path? No, horses will not be permitted to use the path. How will you make sure motorcycles don't use the path? As part of the works, we want to improve access arrangements and review existing barrier types. We welcome comments from the local community about the best way to improve access for users, especially those with mobility difficulties, whilst seeking to prevent mopeds and motorcycles getting into the park. How will you stop cyclists from cycling too fast? We will erect signage at access points where cyclists enter to remind them the path is shared and to respect other users. We welcome comments from local residents on the discussion about shared usage of the path. Experience of shared use paths in other Bristol parks suggests the vast majority of cyclists do not go fast and do respect other users. Why don't cyclists just use the existing Cheswick Village path? Some cyclists may continue to use the Cheswick Village path and it will depend on where they are going. The new path provides a shorter route to the M32 underpass and access to the east. There are cyclists already using the grass path. Here you can find larger versions of the plan drawings, the FAQ, and other documents.